What size container should you choose for growing tomatoes in pots? Containers suitable for growing tomatoes in pots on your patio or deck come in all shapes and sizes. A good container should be large enough for adequate soil and roots. Most successful container gardeners choose larger containers (5 gallons or more), small to mid-size containers (1-3 gallons), or hanging baskets. A common mistake is to select a pot that is too small for the tomato variety. Tomatoes have extensive root systems. When they get root-bound, they produce fewer fruit. Even varieties that are supposed to grow well in 1- or 2-gallon pots will likely do better in a larger pot. When in doubt, go with a larger pot rather than smaller. If you’re a beginning gardener, you can succeed in growing tomatoes in pots when you select the appropriate tomato variety for your pot type. More varieties are available for container tomatoes than ever before. 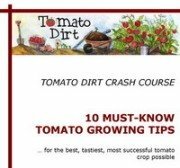 Learn about the best tomato variety for your container here. Tomatoes in pots (like other homegrown crops) need good drainage. Otherwise water will pool in the container and roots will rot, killing the plant and all its tomatoes along with it. Make sure that your container or pot has drainage holes in the bottom. Then, if you over-water the excess will seep out the bottom. Punch holes in bottoms of containers that don’t have them already. Your container should also enough room at the top to allow for adequate watering. You may also want to consider a simple and affordable deck irrigation kit or a drip irrigation kit for container gardening. You can even set the drip hoses on a water timer. What are advantages of different container materials? Containers come in a variety of materials – each with its advantages. Terra cotta and clay. These are natural choices for tomatoes because they blend in well almost anywhere. Natural materials also lend themselves to good circulation. Air and water move well through them. But a word of caution: terra cotta and unglazed pottery can dry out quickly. You need to monitor tomatoes in these containers often to make sure they get enough water. Also, extreme changes in temperatures can make pottery crack more easily than other materials. 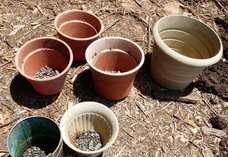 You may need to replace clay pots more often than containers made of something else. Check out terra cotta planters in different sizes and shapes. Plastic. Practical and inexpensive, plastic containers have become one of the most popular container choices. They withstand freezing and thawing. Plastic also retains moisture readily – soil in plastic pots tends to require less watering. New advances in plastics mean more variety in styles. (Here's a terrific list of plastic garden planters). Other container materials. Concrete, fiberglass, cast iron, wire, pressed paper, metal – even old buckets, wheelbarrows, garbage cans – most any material is suitable for growing tomatoes in containers. Five gallon buckets (from drywall compound or paint), properly cleaned, are widely used – gardeners create drainage holes in the bottom with a hammer and large nail. Some gardeners even grow tomatoes in black plastic trash bags! Just make sure your container has enough room for a root system to develop and that the bottom has holes punched for drainage. (Browse this large selection of garden planters). Tomato grow bags are becoming an increasingly popular alternative. Make sure to select higher-quality grow bags. Some are made of felt-like double-layer polypropylene that breathes well and is resilient enough to last several seasons.